What are the contents of an e-way bill? When is an e-way bill generated? Who should generate an e-way bill? How is an e-way bill generated? What are the penalties associated with the e-way bill? An e-way bill is a permit needed for inter-state and intra-state transportation of goods worth more than Rs. 50,000. It contains details of the goods, the consignor, the recipient and the transporter. It can be electronically generated through the GSTN. The e-way bill has been made mandatory for inter-state supplies from April 1, 2018 and for intra-state supplies from April 25, 2018 in certain states (Arunachal Pradesh, Madhya Pradesh, Meghalaya, Sikkim, and Puducherry). As of 16th of June, 2018, e-Way bills are only required for transporting goods worth more than Rs. 1 lakh, within Delhi, i.e. intra-state movement. An e-Way bill isn’t required for movement of goods that involve registered sellers and unregistered customers, within the state of Delhi. As of 6th June, 2018, e-Way bill is required to be generated only when transporting goods worth more than Rs. 1 lakh, within the state of West Bengal. As of 2nd June, 2018, e-Way bill is required to be generated only when transporting goods worth more than Rs. 1 lakh, within the state of Tamil Nadu. Learn more about the latest update on e-way bill system for intra-state movement of goods here. An e-way bill must be generated before the goods are shipped and it should include details of the goods, their consignor, recipient and transporter. Non-supply transactions like export/import, return of goods, job work, line sales, sale on approval basis, semi or completely knocked down supply, supply of goods for exhibition or fair, and goods used for personal consumption. Every registered person who may be a consignor, consignee, recipient or transporter should generate an e-way bill, if the transportation is being done through their own or hired means of transport (air/rail/road). An unregistered person who is supplying to a registered recipient. Here, the recipient will need to follow the compliance procedure since the supplier is not registered. 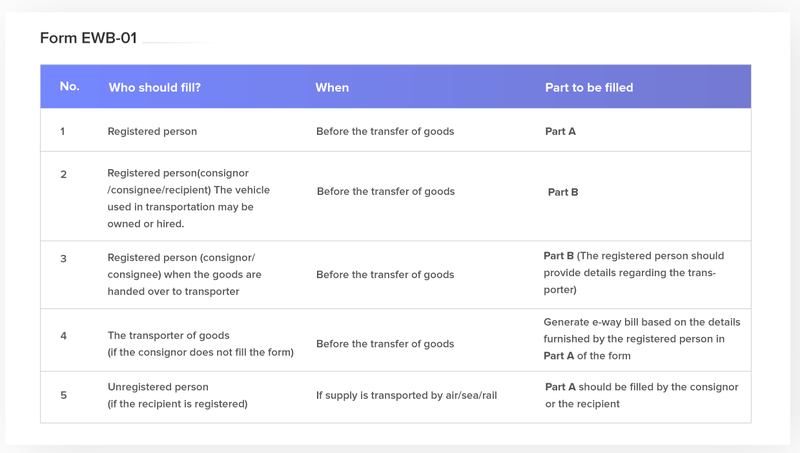 The transporter should generate an e-way bill, if both the consignor and the consignee fail to generate an e-way bill despite having handed over the goods to the transporter, for conveyance by road. Note: The consignor can authorize the transporter/courier agency/e-commerce operator to fill PART-A of the e-way bill on their behalf. When the goods are supplied by a principal to a job worker in an inter-state transaction. During an inter-state transfer of handicraft goods by a supplier who has been exempted from GST registration. The bill can be issued from the GSTN. Learn how to create an e-way bill through the GSTN. Once it’s generated, the supplier, the recipient, and the driver involved in transportation of the goods will be provided an e-way bill number (EBN). Alternatively, the supplier can generate and cancel e-way bills through SMS, if they do not have access to internet. However, to initiate this process, the supplier should first log on to the GSTN portal, and choose the ‘For SMS’ option from the ‘Registration’ tab on the dashboard. The details of the generated e-way bill will be made available on the common portal for the recipient. The recipient of the supply should either accept or reject it on the portal. If the recipient doesn’t take any action within 72 hours, the e-way bill is considered ‘accepted’. Note: The Part-B details need not be updated if the distance covered by the vehicle is 50km or lesser. In this case, the e-way bill can be generated with only the Part-A details. The validity of an e-way bill is based on the distance travelled. The invoice, bill of supply, or delivery challan. For transportation by road, the transporter should carry their transporter ID. For transportation by rail/air/ship, the transporter should carry their transporter ID, transport document number along with the date of transportation. A copy of the e-way bill or the e-way bill number (EBN). The transporter can either carry a physical paper copy of the EBN or map it to a Radio Frequency Identification Device (RFID). If the value of the consignment is less than Rs. 50,000. When the goods being shipped are exempt from GST. Note: If the consignment contains both - exempt and taxable goods, the value of exempt goods is excluded from the value of the consignment. If goods are transported by non-motorized conveyances (example: railways). Though an e-way bill is not required, an invoice or a challan should be carried during the transportation of goods. If goods are transported from a port, airport, air cargo complex or land customs station to an inland container depot or a container freight station for clearance by the Customs Department. Transport of goods as specified in Annexure to Rule 138(14) of the CGST Rules, 2017. An authorized officer may halt the vehicle to check the e-way bill or see the e-way bill number on paper. Verification of the e-way bill may be done through a Radio Frequency Identification Device (RFID), if the e-way bill has been mapped with RFID. If a consignment is found without an e-way bill, the concerned person should pay a penalty of Rs. 10,000 or the equivalent amount of tax evaded (the greater of the two).